This is the first Vision Interest Group (VIG) notice here on Webvision. The VIG is designed as a resource for students and post-docs to present their work/research to their contemporaries and all interested parties who wish to attend and participate. 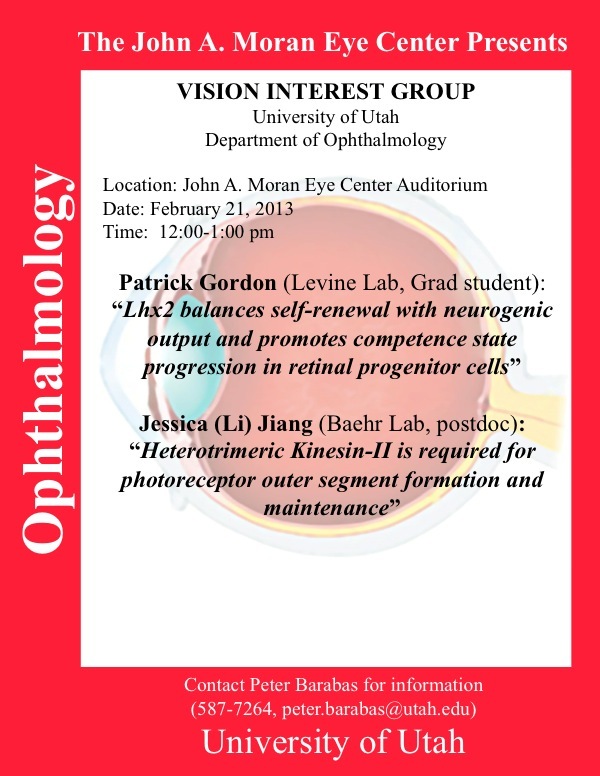 The February VIG at the John A. Moran Eye Center will be held on February 21st from 12:00pm to 1:00pm in the John A. Moran Eye Center auditorium on the 1st floor. Moderator: Peter Barabas, Postdoc from the Krizaj lab. Pizza from The Pie is kindly provided by Dr. Robert E. Marc.